Amelia is a mermaid that is bored with the ocean and starts exploring. She ends up caught in a fisherman’s net. She sees the loneliness in his eyes and although he lets her go she decides to turn human and spend time with him. He is her first love and one day disappears at sea. Then she is approached by someone talking about museums and PT Barnum. Amelia decides she wants to see more of the world and joins PT Barnum as the Feejee Mermaid. When Barnum realizes that he has a real mermaid he decides he is going to keep her from escaping him and Amelia realizes that world is not as wonderful as she first thought. 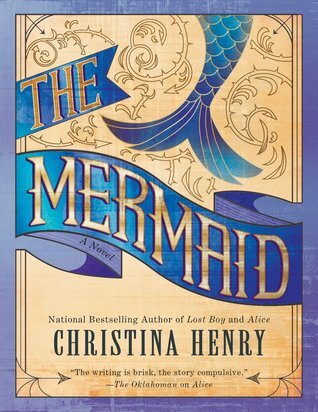 After reading Alice, Red Queen, and Lost Boy I couldn’t wait to see what Christina Henry came up with for the Little Mermaid. Well, this is NOT based on the Disney movie. Amelia is a mermaid that is not content and goes exploring. Of course she gets caught by a fisherman but ends up going back to him and he becomes her first love. This was a wonderful story, one of those that could easily be a HEA. But of course that is not how Henry works. After the loose of the love of her life, Amelia is approached to be a mermaid for PT Barnum. She agrees but quickly learns that Barnum is a shrewd business man and not about to let her go. I really enjoyed this story about the Feejee Mermaid. I admit that I have never known the true story but I knew enough to identify it as one of Barnum’s attractions. I love how this story progressed and watching Amelia find her place in our world. This is a great story and one that I recommend checking out. I love how this book is a historical twist on a hoax. It really added another dimension to this tale. I would like to thank Berkley for the opportunity to read and share this book.